The code name all fall and winter was the CEO book. Now that it's done, we're ready to tell you about the new baby Sound RIDER! 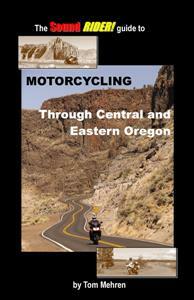 is going to hatch this spring: Motorcycling through Central and Eastern Oregon. Everyone here at Publishing Central wears a few hats and our cartographer, Ryan Barnett from Cartiac Arrest, was tapped to interview the book's author and Sound RIDER! publisher Tom Mehren. We've also included some of the pictures from the project here. RB. You just finished your new book. How does it feel? TM: It's a relief. When I was in the music business, I remember making records and going through the process from start to finish. It gets intense, but having the finished product in your hands brings a sense of relief. During the final weeks of production, I was juggling a number of other projects along with trying to stay intently focused on this one. I hope people like it. RB. Why Central & Eastern Oregon? TM: I recall one day that our good friend Bruce Scott was talking with excitement about a trip he'd just done through the area. I had ridden a few roads there and was eager to do more. Last summer I spent an extensive amount of time in the region, and got a healthy dose of what Bruce was talking about. It's not exactly the first place that comes to a casual rider's mind, but for those of us who have gone back and forth on Windy Ridge too many times, we get eager for something more, so Central and Eastern Oregon becomes the next logical place to visit. RB: What did you get out of writing it and what are you hoping others get out of it? TM: This is the third ride guide I've done about places in the Northwest. Each time we put one together, I work hard to make them better and better. More rides, more listings of places to eat and so on. I had a lot of great experiences putting the book together, and the hope is that the book will share those experiences to the fullest with the riders who read it. RB: How many rides are in this book? TM: There are 24 paved rides and 5 dual sport routes. The book flows from west to east ride-wise, that way when you finish one, you can start another nearby. RB: What's new in this book that evolved from past titles? TM: By request, we've added a map of the entire area in the front of the book and noted where each ride is and what page it's on. That will be a big help to the power users. The restaurant and accommodations directories are FAT. You won't go hungry and you won't chow on garbage if you stick with the directory. You won't stay in a flea bag motel and you might enjoy some of the camping sites we've come across if you use the directory provided. We even went as far as to put resorts in since sometimes people just want a day off from riding to soak in a sauna or whatever. The maps are some of the best we've ever done, noting each and every road included along each route. RB: There's an extensive section on Oregon motorcycle law and tips about riding there. Is this necessary? TM: Speeding in Oregon carries an expensive citation. If I can save someone $1,000 by talking about that, then the book was well worth the purchase. Other things included are the insurance requirements and fuel laws. For the dual sport riders, I cover the issue of clay in several places because I thinks it's that important to remind you of the areas where it is found. RB: What was the inspiration for doing this particular book? TM: Several, actually. I went to a rally in John Day last year where we were handed a one page black and white photocopy of a map with five colored lines outlining some rides in the area. No information about the rides themselves, no information about gas availability or restaurant options. Just a single sheet of paper. I wanted more! About the same time, we'd come up with the concept to create a book called 100 roads and rides you just gotta do in the Northwest! Yeah � I know � long name, right? Then the BMWMOA announced they would bring their national rally to Redmond, Oregon. Surely there would be a demand for a book like this, so I scrapped the 100 rides and roads idea and went to work on this one. RB: You've got some interesting names for the dual sport routes. How did you come up with them? TM: Things get boring in the digital kitchen and you need to do something to crack yourself up now and then. Coming up with comical ride names is one way to do it. I take elements of the ride and string them together to form a bizarre name that on the surface makes little sense, but once you read about the ride it all comes together. Like the way it does with the Grizzly Bhagwan Painted Hills Boogie. RB: Do you have a favorite ride in the book? TM: I just love those corners on US 395 between Dale and Ukiah, but the twisties along the Crooked River can't be missed, and then there's that whole lower half of 207, and all that winding along the John Day River, and I love the road through the lava fields along the Mackenzie Highway and � I can't pick just one � sorry. To purchase your copy of the Sound RIDER! 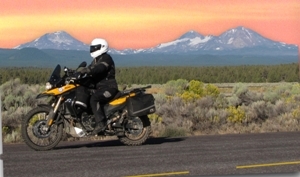 Guide to Motorcycling Through Central and Eastern Oregon - CLICK HERE!